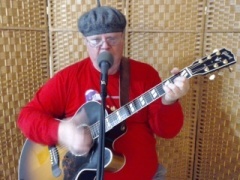 Pete Bensen | Original And Classic Cover Tunes! Picked up guitar, many moons ago, couldn't put it down. Now I write songs, sing the blues, and hope to see you 'round. I'm older than I can recall, younger than I'll be, y'all. Is to click on me when "On the Air", and listen free, without a care. 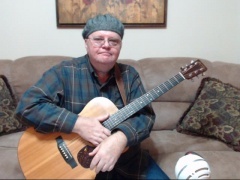 Hi, I'm singer/songwriter/guitarist Pete Bensen. American music, and the incredible depth of the American language, has been my love, muse, and best friend since I've been in short pants. And I don't mean since last summer! 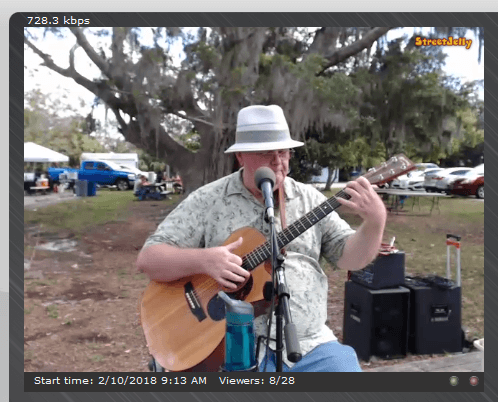 Originally from New York, now living in Southwest Florida, my hope is to bend your ear with my own original music, along with select covers and arrangements, and have FUN doing it! Most of all, I hope you will enjoy it as much as I do. Fort Myers, Florida has a monthly music event called the Fort Myers Music Walk. Musicians can register for free and are encouraged to seek out participating local merchants to reserve a good spot to perform. The weather is nice, the people are nicer, and it's a festive atmosphere for the Music Walk and the monthly Fort Myers Art Walk and Mystery Walk as well. The best part for me, is that I can simulcast my performance on StreetJelly.com using my mobile phone as an internet hotspot. I get good video and sound quality using 4G mobile internet! I am a member of Fort Myers Americana Community Music Association, where I perform regularly, as both an opening act and featured performer. My other regular gig is as bassist for Fort Myers Evangelical Free Church's praise band. The Fort Myers area has NUMEROUS open mic opportunities. Great for networking, testing new material, and for spreading the word about StreetJelly.com! The first time I performed with my first band "The Bolts" my knees were shaking so hard I thought I was going to fall down. But we were well practiced and had a successful 3 song set for a church variety show. We stayed together for quite a while, had a couple of paying gigs and we all moved on. All my adult life I've been a guitar collector. The main guitars these days are my Martin 000C 16GTE (a gift from my mom), a Gibson Starburst Acoustic, and a Gibson EC-30 Acoustic. Well-cared for and well-loved! My first guitar was a no-name acoustic. A gift (with some instruction) from my Aunt Vivian. Many other guitars have come and gone over the years. My most recent acquisition is a Voyage-air travel guitar. It has an ingenious folding neck and fits into an airlines overhead compartment. I love them all! 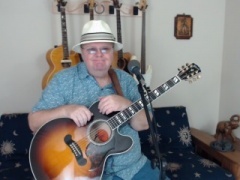 As well as acoustic and electric guitar, I play harmonica and bass, including fretless Fender J-bass.